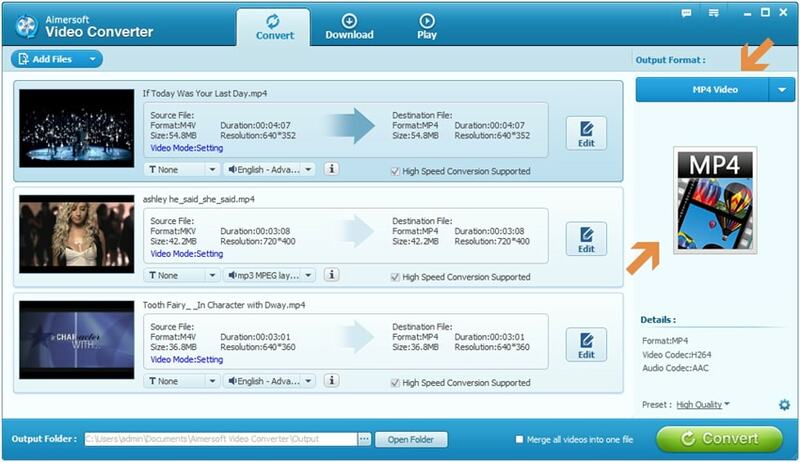 Aimersoft Video Converter is a high-speed digital video converter that enables you to quickly convert video to virtually 500 formats. 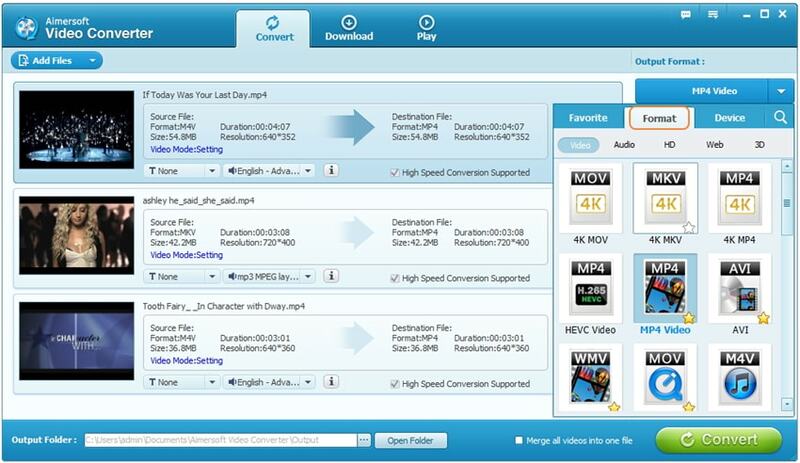 Download it and follow the guide to learn how to convert/edit/download/play video and audio files. Click Add Files button to load video/audio files from your computer, or directly drag those media files to the primary interface. Then the loaded video files will be displayed just as the screenshot shows. Click the drop-down menu under Output Format: or hit the format icon as circled to get the output format list. Now you can convert video to MP4, MOV, MKV, FLV, AVI, WMV, M4V and various formats under Video, Audio, HD, Web and 3D tab, just choose an output format that you prefer. You can also switch to Device tab to directly convert video to fit your portable devices like iPhone, iPad, Samsung, HTC, LG, etc. You can hit the drop-down icon for more video presets. Click … to specify an output folder where you store the converted video file. Then hit Convert button to start video conversion. In a while, you can see the conversion completes with the Finished sign. Now you can click Open Folder to fetch the converted files. Before video conversion, you can personalize and touch up your videos in clicks. All you need is to click Edit icon to get the video editing window. Then you’ll see Mode, Trim, Adjust, Effect, Watermark and Subtitles 6 video editing functions as follows. Mode: Change original video mode to the proper one of 2D 180 degree, 3D 180 degree top/bottom, etc. Trim: Trim your favorite part from the video to convert for your portable devices. Adjust: Rotate/crop video, customize the frame size (16:9, 4:3 etc.) and cut off black margins. Effect: Set the brightness, contrast, saturation of the video and apply different movie styles. Watermark: Add image or text watermark to videos. Switch to Download tab in the top, then you’ll be able to download online video/music from YouTube, Vimeo, Hulu and other 1000+ sites. Step 1. Copy the URL of your favorite video that you want to download. Step 2. Click Add URL button to get the Add New Download windows and paste the URL to the blank. Step 3. Click the drop-down icon beside Save as: to choose the output format as you like and hit OK to start downloading online video. Step 4. Once finished, just go to Finished tab to get the downloaded video files. If you want to convert YouTube video to MP3 for easy playback, just follow the steps below. Step 1. Copy the URL of your desired YouTube video or playlist that you want to convert to MP3. Step 2. Click YouTube MP3 button and paste the URL to the blank. Step 3. Click … to customize the location where save the extracted .mp3 file. Step 4. Hit OK to start download YouTube to MP3. You can also record online video in case of download error due to some unknown reasons. Step 1. 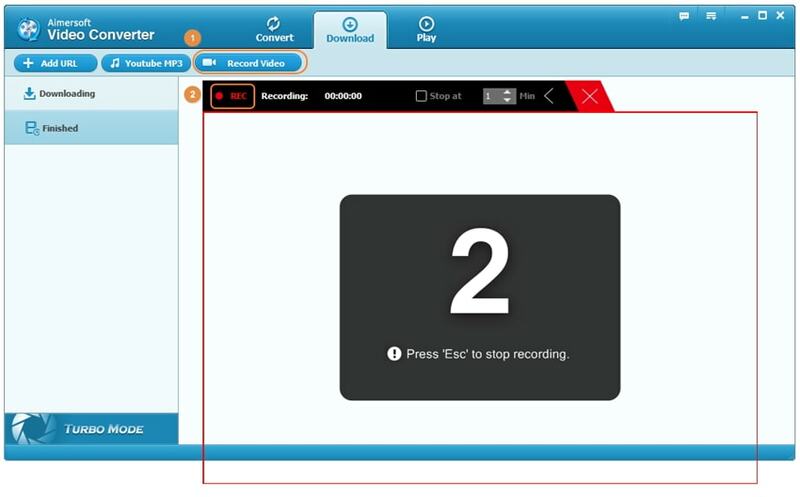 Click Record Video and you’ll get a pop up window for recording. Step 2. Drag the recording box to the proper place as you wish. Step 3. Click the REC on the top left to start recording, there’ll be 3 seconds countdown for you to prepare. Step 4. Press ESC to stop recording and the recorded video will be displayed on the main interface. 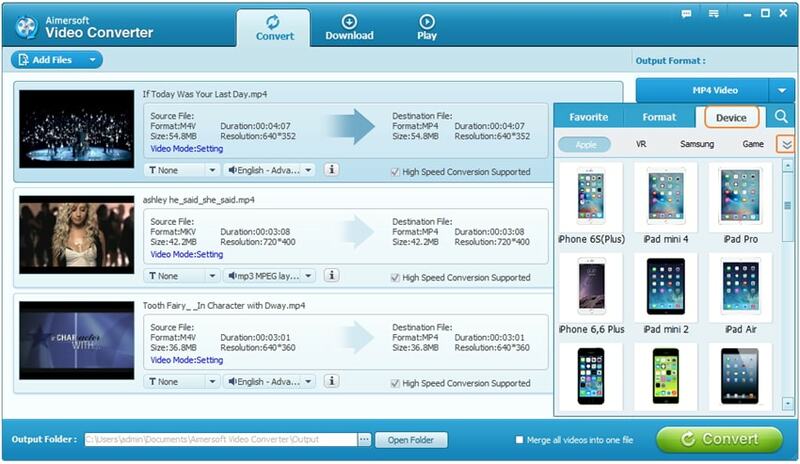 Aimersoft Video Converter also functions as a perfect media player that plays any video and DVD files in one click. Go to Play tab in the top and click Open Files to add your desired media file. 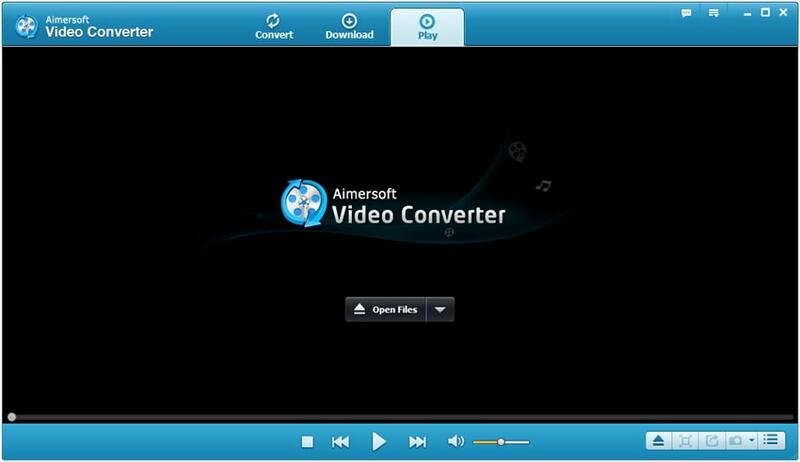 Then you can see Aimersoft Video Converter starts playing the video immediately. While playing, you can snapshots of your favorite movie scenes, enjoy fullscreen view, convert files, etc. from the functions keys in the bottom right.